NOTE: This question is NOT a duplicate of Bluetooth and Wifi interfering with one another since Yosemite. That answer pertains to 1) The 2.4 GHz band only and 2) Yosemite only. Though currently I’m running Yosemite (10.10.3), I have consistently experienced this issue since purchasing my Macbook Pro (Late 2013, originally running Mavericks). Whether it be a bluetooth mouse, headphones, or even iPhone, whenever I pair a device with my Macbook Pro, my Wifi speeds (running on 5 GHz band) drop by at least %50. I can reproduce this issue repeatedly. It only occurs when a device is paired via bluetooth to the machine. It does not occur when bluetooth is simply enabled on my computer. At this point, I just don't connect devices via bluetooth anymore since the WiFi drop is noticeable. I am using a Logitech nano receiver mouse (and using up one of my precious two :( USB ports in the process) rather than using a Bluetooth mouse. I use a TP-LINK Archer C8 Router connected to a modem provided by my ISP (running in bridge mode). I use the 5 GHz band exclusively. To rule out any band interference, I’ve tested the WiFi speed on the 2.4 GHz band as well. The same drop occurs regardless of the band. I’ve used my ISP’s modem as a Gateway to directly connect to the internet (to rule out the TC-Link Router as the cause). Same result. I’ve isolated the issue to that of a Wireless one. Originally, I thought the issue was with my Logitech M557 mouse. I tested my Magic Mouse instead. Both yielded the same drop in Wifi speed. The same has gone for any device that I paired with my MBP - Apple brand or not. Sidenote: I’ve unpaired the devices after testing. I only have one device paired (though not actively connected). The issue persists without any third party kernel extensions loaded. Additionally, with no other third party software running (Dropbox, for example). This issue has occurred since purchase, in Dec 2013. Across OS X Mavericks - Yosemite. Additionally, the machine has had a clean install of OS X from a fresh Yosemite image. I ran the Apple Diagnostic Test, repeated times, with no error codes. On a separate issue (blown out builtin speaker recently), I had brought my machine into Apple. I had them run their in-house diagnostic test to confirm no BT related hardware issues. Additionally, as stated, this issue has been a problem from Day 1. Why does my Macbook Pro's WiFi speed drop by 50+% when paired with any Bluetooth device? Is there a solution? Disconnect all peripherals from your computer. Open System Preferences. In the "Energy Saver" preference, de-select "Wake for network access" (no check, and leave it that way). Open the finder. Select the "Go" menu. Select "computer." Select "Macintosh HD." Go the the "Library" folder. Go to the "Preferences" folder. Find the preference file "com.apple.bluetooth.plist." Rename "com.apple.bluetooth.plist" as "com.apple.bluetooth.plist.old" (i.e. add ".old"). Eventually, if this solution works for you, you can delete this "old" preference file. Restart your computer (this will create a new "com.apple.bluetooth.plist" preference file). Apparently, the problem is a bug caused by a bad interaction between the bluetooth preference file and wifi. You have explicitly written that you tested both 2.4GHz en 5GHz, nevertheless I am still giving this as an anser. In your new software setup, I think your bluetooth uses the same frequency as your WiFi, they are proberbly both on 2.4GHz. Change your WiFi to fixed 5GHz if possible or choose try 2.4GHz channels (some users see big differences on different channels). If your signal is weak, lets say 50, but the noise is low, lets say 10, then there is still 40 left for data transfer. If your signal is strong, lets say 80, but the noise is high as well, lets say 50, there is only 30 left for data transfer. Simpel said: Noise is usually radio signal in the same frequency range. Knowing this, there is a good article on the Apple website that explains what is happening. It also has some links to other good documentation, like the Wireless Diagnostics support page. I summarised the most important parts. Try changing your access point to use 5 Ghz or a lower 2.4 GHz channel. When you use a Macintosh with an AirPort or TimeCapsule basestation, by default, this should go automatically as the two machines try to get the highest signal to noise as possible and switch frequencies automatically. I have the same problem with my MacBook Pro Retina 13" 2014 on Yosemite 10.10.3 and 10.10.4 with Apple AirPort. My problem is not depended on bluetooth state at all. 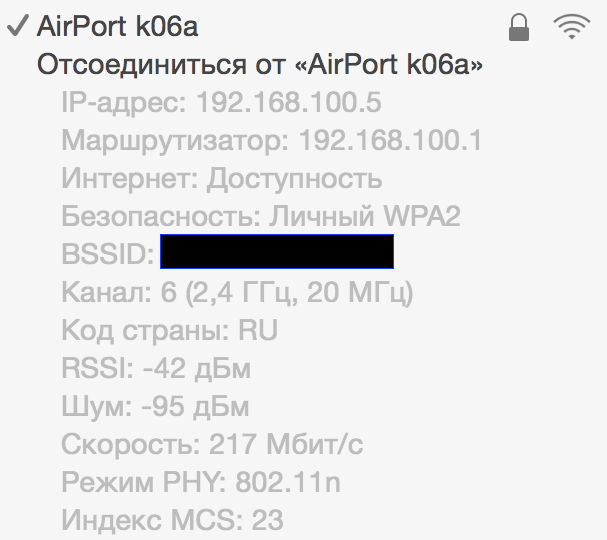 Wife's MacBook Air have no problems at all, looks like it does not support 802.11ac at all - only 802.11n. So I think the problem is in 802.11ac. Just found how to fix it – this is not good fix, but it works. 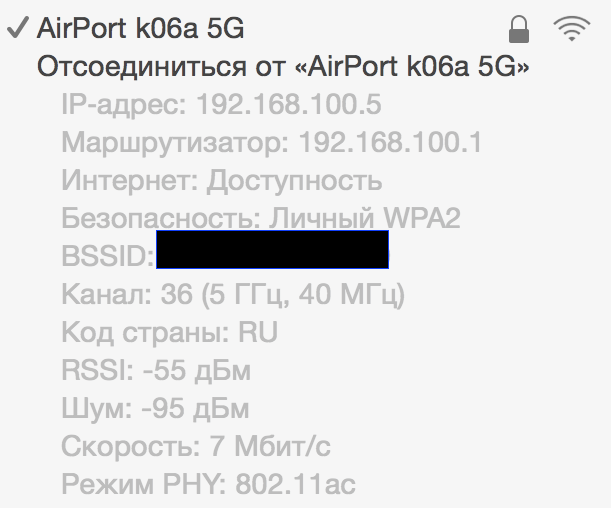 I have changed AirPort 5GHz network name and connected not to 5GHz network. Looks like connecting to 5GHz network causing this problem every time I try. Not the answer you're looking for? Browse other questions tagged macbook yosemite network wifi bluetooth . Two Bluetooth devices + MacBook Pro + 2.4gHz WiFi = no network throughput; why? How do you force a 5 GHz wifi connection? 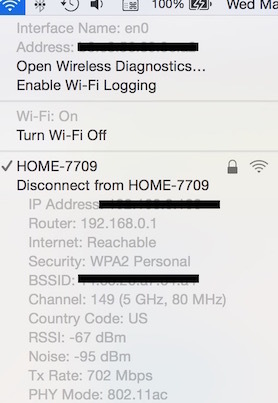 Why does my Apple TV cause wifi to drop on my MacBook?